Do you get a buzz from cooking? For many, cooking can be therapeutic – the peeling, chopping or grating of ingredients can do wonders for stilling an active mind. It could even be considered a form of mindfulness as you concentrate on the job in hand allowing you to slow down and focus. Even better, you have a fantastic meal as the result. In the US, culinary therapy is becoming a popular method of treatment as part of the management for a range of mental and behavioural health problems. Used for depression, ADHD, addiction or eating disorders, culinary therapy enables individuals to relax and engage in an activity that is fun and creative. We eat for nourishment to maintain health and vitality. Research has found that the B vitamins, omega 3 fats, amino acids iron and zinc are all particularly great for maintaining a healthy brain. Preparing your own food enables you to control your diet, ensuring it’s consistently high in the vitamins, nutrients and fibre we need. The brain works at a very high metabolic rate so a large proportion of the body’s total energy and nutrient intake is expended. As mentioned before, the process of preparation of food and cooking can be used as a tool for mindfulness. This is a technique which has become increasingly popular to aid your psychological health and de-stress. 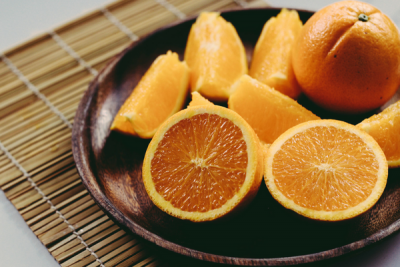 As an example, if you focus on something like an orange, its skin, its smell, colour, the juice and texture. The very fact that you have centred your thoughts solely on the orange, means you will most likely have forgotten about the problem that’s been on your mind all day! This in turn reduces stress and promotes a healthy mindset. Most people will have enjoyed cooking for friends and family, having them round the table appreciating the dishes that have been lovingly created for them. For many, cookery is an outlet for creative expression, experimenting with different flavours and textures to put together something a bit different. Additionally, inspiration might come from the ingredients already in the cupboard or fridge. This will not only save you time, but will add to your achievement of creating your own recipe. Many busy parents may think cooking is a chore – trying to come up with something easy, quick and nutritious every day is quite a task. However, if you compare it to washing, ironing or cleaning, it’s got to be the most enjoyable and creative of the household tasks! Being able to eat what you prepare is a fantastic reward in itself – just go with it and enjoy the entire process. At the Gascony Cookery School, you would never find cooking a chore! Offering the combined knowledge and experience of two professional chefs of French cuisine, one French and one English, the Gascony Cookery School offers an introduction into French cookery courses that are not only thorough, practical and accessible to all, but also enjoyable. Click here to see all the courses we offer and their availability.